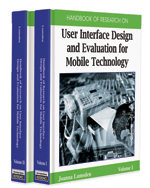 This chapter presents a case study of the redesign of the mobile phone keypad graphics that support the Motorola iTap™ stroke-based Chinese input solution. Six studies were conducted to address problem identification, proof of concept evaluation, usability testing in both US and China, and design simplification to support business objectives. Study results confirmed that a new abstract-with-examples design helped users to develop more accurate knowledge regarding stroke-to-key mappings and lead to significant improvements in both text-entry speed and accuracy. The data also showed that, when using the new keypad graphics, the stroke-based input method could outperform the popular Pinyin technique after about 1 hour of casual usage, making the stroke method a competitive alternative for Chinese entry on mobile phones. Mental Model: A mental model is the users’ internal representation of how a system works. Pinyin: Pinyin is the official Romanization system for Mandarin. It uses the 26 letters of the Roman alphabet to define the pronunciation of Chinese characters so that they can be entered using the standard western keyboard. Text Entry: Text entry refers to the process of creating messages composed of characters, numbers, and symbols using mobile devices. Text entry can be performed using small physical keys, virtual keyboards presented on touch sensitive screens, gesture or handwriting recognition, speech recognition, and various other technologies. Chinese Character: A Chinese character is the minimum functional unit of Chinese language. Stroke: Stroke is the minimum writing unit of Chinese language. Each Chinese character is constructed by writing one or more strokes in a specific order while following specific spatial relations. Mandarin: Mandarin is a northern Chinese dialect that is the basis for the official pronunciation of each Chinese character for Pinyin. iTap™ Software: iTap™ software was developed by Lexicus and Motorola, and enables predictive text entry in mobile phones. iTap™ software supports both Pinyin and stroke-based entry.